Would you purposefully destroy the nest of a wild turkey or grasshopper sparrow? Of course not. 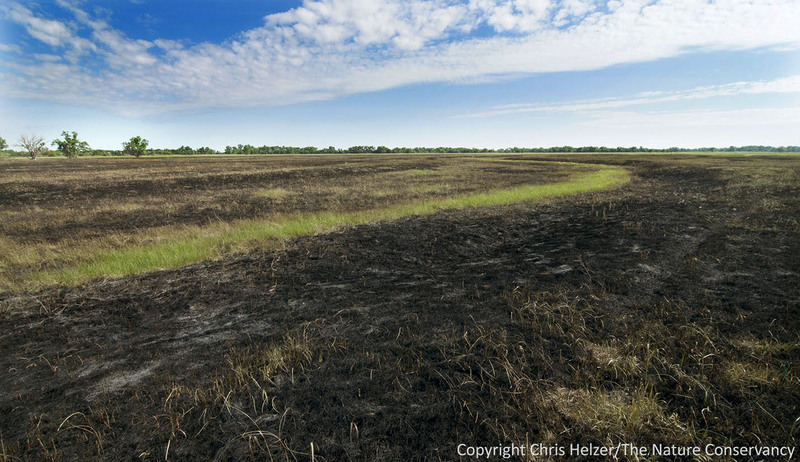 But what if that destruction was a consequence of a land management action that benefits the larger prairie community? That was the situation we were faced with last week as we mulled over whether or not to conduct a late spring (early summer?) prescribed burn. 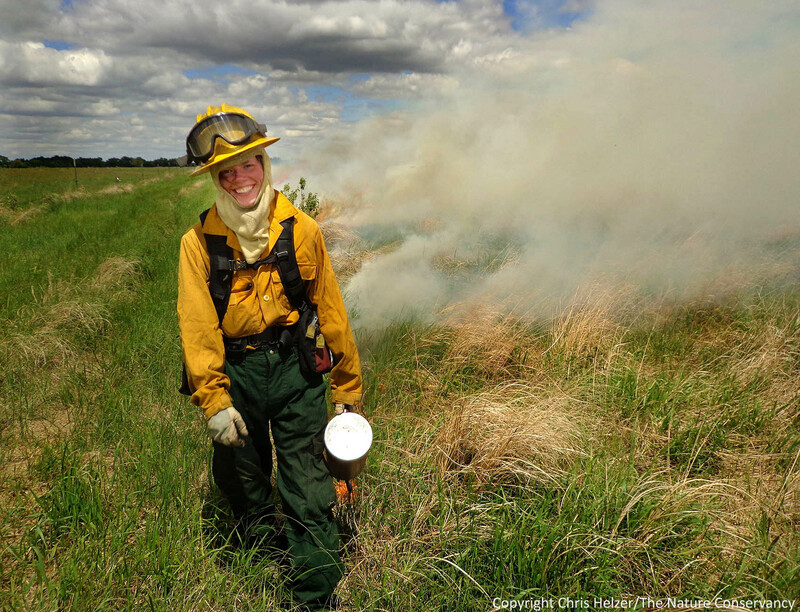 Michelle Biodrowski ignites a prescribed fire last week (June 6) at a wet-mesic prairie. The Nature Conservancy’s Platte River Prairies. 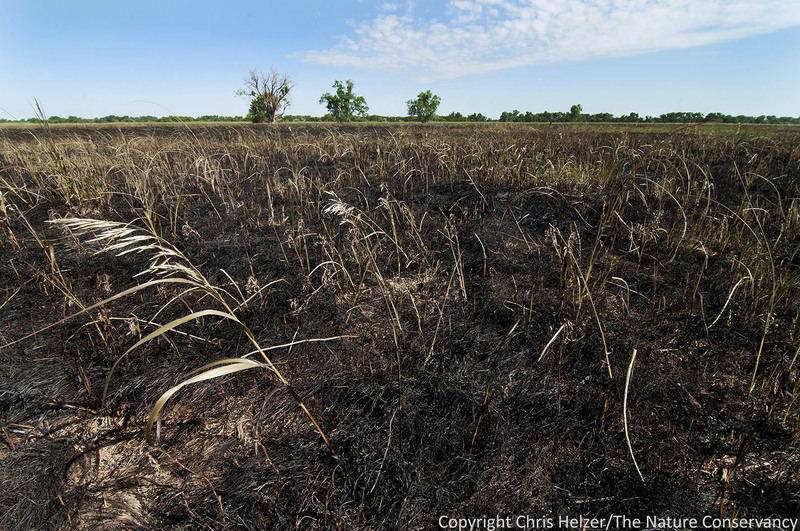 In the aftermath of any prescribed fire, there are winners and losers. Fire rapidly and dramatically alters habitat and growing conditions in ways that favor some plant and animal species and put others at a disadvantage. Fires also kill some insects and other animals outright. 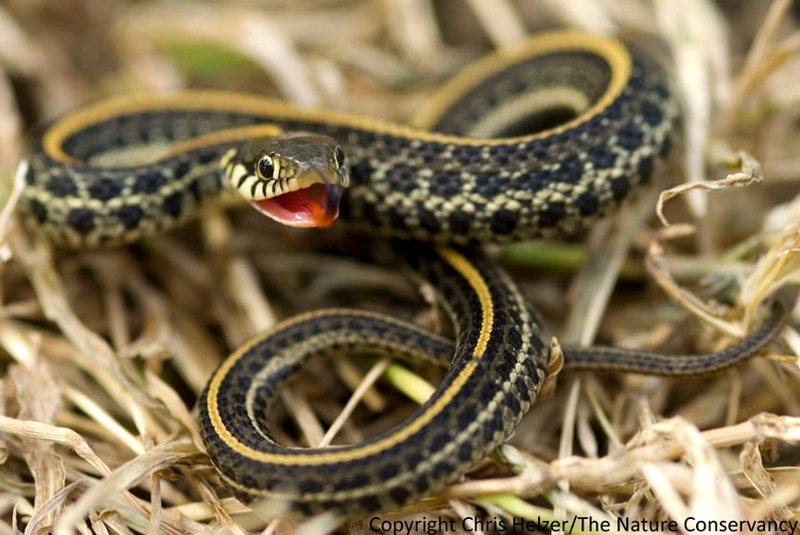 For example, dormant season (late fall through early spring) fires burn up a lot of invertebrates that overwinter in prairie thatch. Growing season fires, of course, can kill numerous small animals – especially slow-moving non-flying ones. We usually don’t see the evidence of those impacts, but when we do, it’s no fun. Over the years, I’ve seen way too many fried snakes and scorched nests, in addition to animals who suffered injuries from our fires. It can be tough to deal with the knowledge that I made the decision to light the fires that killed or maimed those animals. I’m sure we burned up a number of regal fritillaries in our fire last week because the females are within a few weeks of emerging as adults, and the kind of thatchy prairie we burned is prime habitat for overwintering larvae. However, we would have done the same damage to those caterpillars if we’d burned the prairie any time between October and July. Fortunately, regal fritillaries are very common in our prairies, so I know the overall population will be fine. 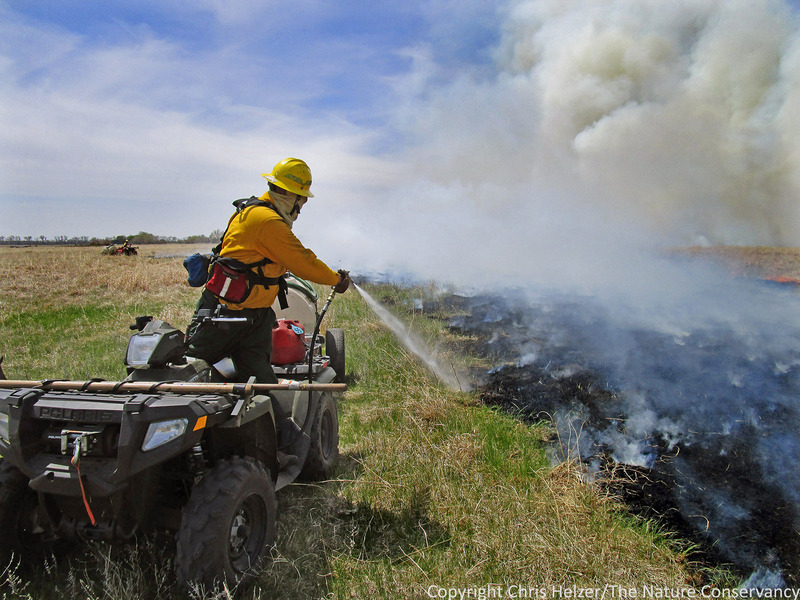 While it can certainly be deadly to insects and animals, fire is also an important part of our strategies to maintain diverse and healthy prairie communities. 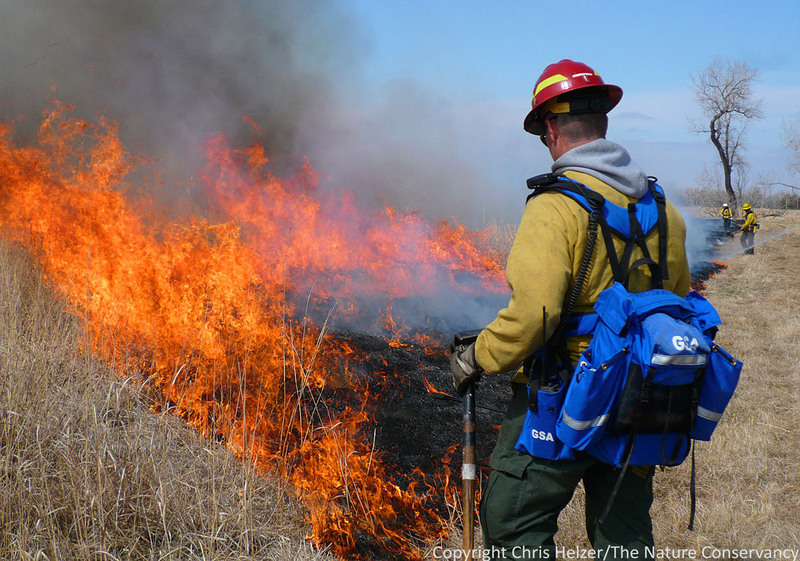 Fire can help suppress invasive species, remove thatch and stimulate vigorous plant growth, and attract grazing activity – among many other things. Prairies that aren’t burned fairly frequently often suffer from tree/shrub encroachment, excessive build-up of litter, and/or dominance by a few native grass species. Other tools, including grazing and haying, can be used instead of fire (or in addition to it) but those can also have negative impacts, and can’t replicate everything fire can do. Knowing that fire can cause problems for some species, we try to minimize those impacts as much as we can. 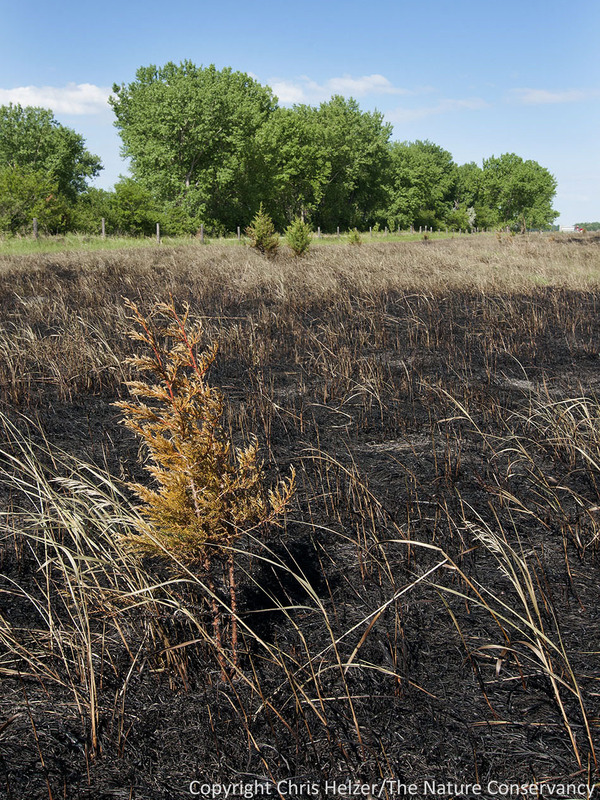 For example, we usually only burn a portion of a larger prairie so that any impacts are not likely to affect the entire population of a species. Smooth brome was mostly done blooming when we burned, and starting to make seed. I’m not sure how much we sapped the vigor out of the brome (a week or two earlier might have been better) but I guess we at least prevented it from making seed this year. The main objective for our burn last week was to create an attractive patch of nutritious grass to concentrate cattle grazing in that portion of the prairie – part of our patch-burn grazing system. We are using a light stocking rate of cattle this year, so we expect the grazing in the burned patch to be selective (the cattle should eat mostly grass) and to favor wildflower diversity by suppressing dominant grasses. Meanwhile, unburned areas won’t be grazed much at all, allowing them to rest from previous years’ grazing and last year’s drought. The result should be a messy mixture of habitat types and growing conditions across the prairie that will allow just about every species to thrive somewhere. We’d hoped to burn the site earlier in the spring, but never got the right weather window to do it. In other sites where we didn’t get our planned burns done this year, we’re using electric fence to temporarily enclose the cattle in what were supposed to be the burned patches. The idea is to get the cattle to graze the areas down sufficiently that when we take the fence down in early July the cattle will continue to graze the regrowth (which will then be the best quality forage in the prairie) in those patches for the remainder of the season – similar to what we’d see in burned patches. 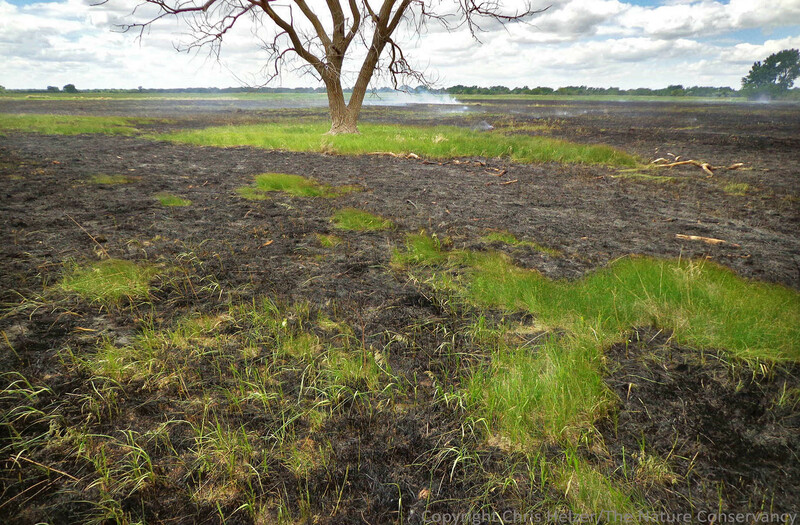 It’s far from a perfect subsitute for burning, but it does at least concentrate grazing pretty well in one portion of the prairie and allow other areas to rest. The biggest disadvantage of the temporary grazing enclosure method is that cattle aren’t very selective in their grazing within that enclosure, so we lose some of the benefits we in burned patches when cattle graze mainly grasses. It was a pretty complete (though pretty slow and smoky) burn last week, but there were a few patches that didn’t burn – mostly in low, wet areas where the thatch was moist enough it didn’t carry fire. The green strip shown here is at the bottom of a wetland swale and is also where I found the surviving red-sided garter snake mentioned earlier. After weighing the pros and cons of burning in early June, we decided to go ahead with last week’s fire. We certainly burned up nests of meadowlarks, grasshopper sparrows, and at least one turkey (a forlorn-looking female was wandering around after the fire). I expect most of those will have time to re-nest, but that only makes me feel marginally better about it. I’m sure we also killed lots of insects and some wildlife species. On the other hand, the burn allows us to move ahead with our management strategy to improve the wildflower diversity of the entire prairie. 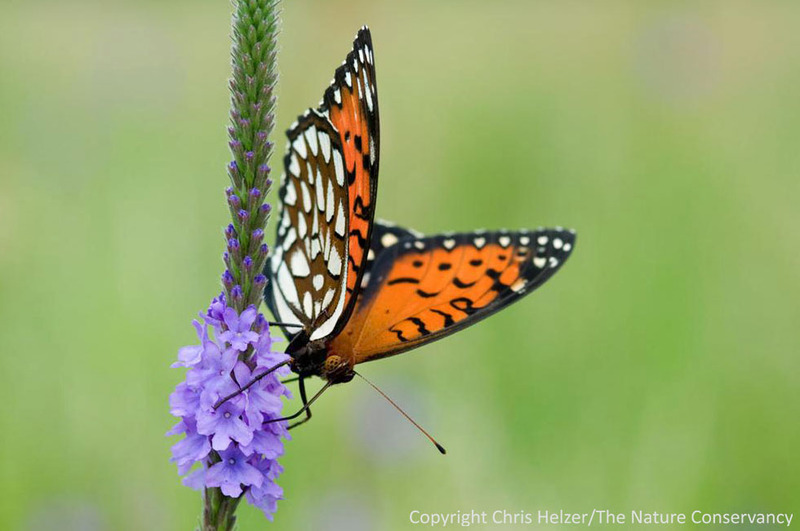 That increase in wildflower diversity will benefit a wide range of insect and wildlife species in coming years, as will the habitat structure created in both the burned and unburned patches. 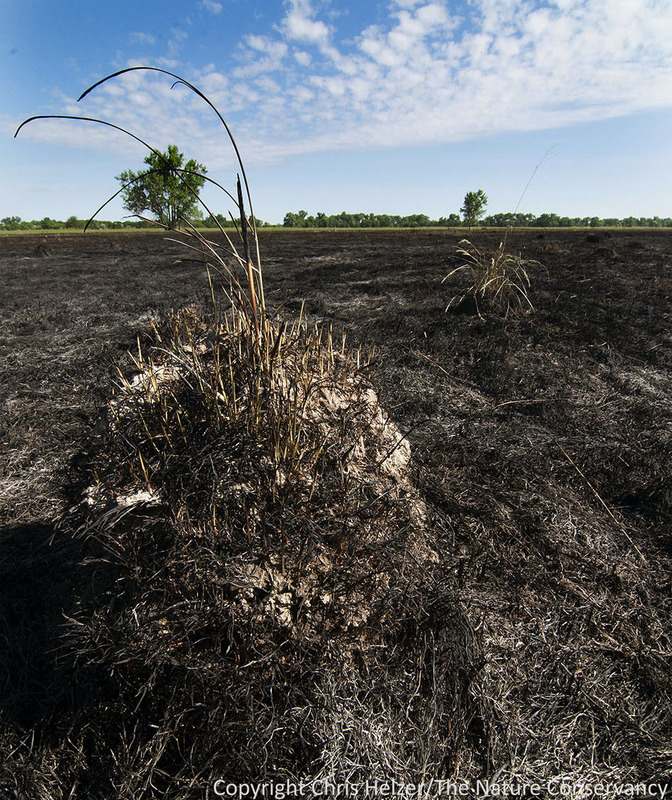 We burned about 65 acres, but left more than 300 acres of the prairie unburned. Actually, there is much more unburned prairie than that, since there are more than 1,000 acres of unburned grassland on adjacent land as well. That unburned prairie should be a great refuge for fire-sensitive species and give them opportunities to recolonize last week’s burn over the next several years. This eastern red cedar burned brown after the fire, but it’s unlikely to die. Experience has shown us that growing season fires rarely “cook” cedar trees enough to kill them. Even when they turn brown, they tend to green up again. 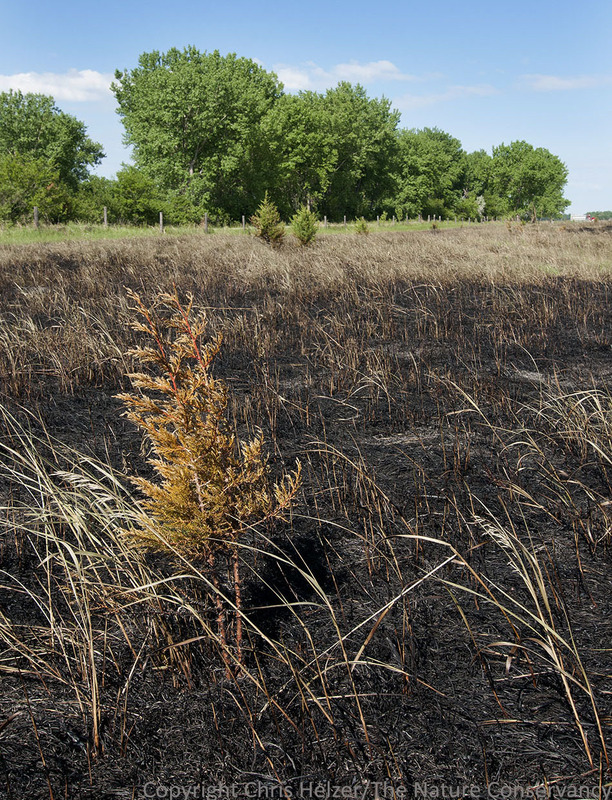 However, this prairie has had numerous dormant season fires, so cedar control was not an objective for last week’s fire. We’ll get this one next time. The kind of difficult decision we made last week is a regular part of land management. Every management treatment leads to the improvement of conditions for some species but hurts others – often literally. Just letting “nature take its course” by not managing at all isn’t any better. An idled prairie eventually becomes dominated by trees and shrubs, along with just a few grass and wildflower species. That degradation of habitat kills or evicts more animals and plants than active management, which maintains diverse plant and animal communities. Right or wrong, I guess I’ve trained myself to focus on the long-term positive outcomes of our management and not to dwell on the short-term negative impacts. I’m not sure if that makes me insensitive or just sensible. One thing that helps me justify our actions to myself is that we’re collecting as much data as we can about the overall impacts of our management. If we’re going to make tough decisions that have negative consequences for other living creatures, I want to KNOW that those decisions are leading to the long-term benefits we think they are. We can never collect enough data to know everything we want to, but we collect enough that I’m convinced most of our management strategies are working as planned, and we constantly tweak those strategies as we learn more. The ants in these mounds appeared to survive the fire just fine. I assume they’ll be able to find plenty of food, and satisfy their other needs, as the prairie greens up around them over the next few weeks. Regardless of the tough decisions we have to make, I love my job. I feel good that we’re improving the condition of our prairies, and that we’re sharing successes and failures with other prairie managers so they can do the same. It’s difficult for me to imagine a more fulfilling career. I always try to focus on the big picture instead of dwelling on the immediate negative impacts of some of our actions. At the same time, I try to be ethical about what we do, and not cause harm when it’s not necessary. It’s a messy world and a messy job, but I wouldn’t have it any other way.